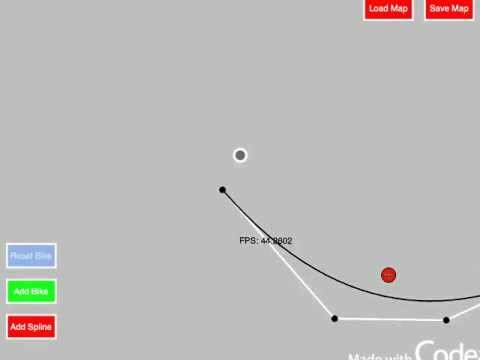 My take on the flash game line rider using a ball and splines, check it out! Very nice. Clean interface and nifty functionality. That is awesome. I love the way you made those curvy shapes always been thinking how to make them. Now that you've made them I atleast know that there's a way to do it!! I plan to make a game out of it but its not that hard to make a game when you've got that! Also note you can only use a table of four vertices in the Spline(v) function. I hope you enjoy it and to make more curves just add them to the table of Splines. Thanks @Luatee. I'll look into it. Just checked that out thats a good way of doing it but make sure when you're holding the ball to set its velocity to vec2(0,0) the BallTouch function but other than that its a good way of doing it, I prefer to keep it in the class though as its easy to create many of these curves. Also the equation itself is standard so feel free to use it, but if you create a game using the classes then all I ask is credit, thanks! Yeah I made the game using classes I just posted this to show it to you. Thanks for the idea and main part of the games code @Luatee. But now I am into a problem how should I move the screen along with the ball. I am trying to use translate but it's not working. I tried using FPS but then the movement was becoming jerky. I'll be grateful if you could help. Well the red circle in the middle (The one I assume you're talking about), I just found the midpoint of all the vectors (the average) so you divide all the points by 4 assuming you have 4 points in total. Then create variable in the class called self.moving and then set it to true in the touched function using a statement such as if touchpos:dist(self.p) < 25 then blah blah end, then create a set of new vectors (we'll call them newvecs, which is a table of four vectors) which consist of each vertex/point minus the midpoint (I call the midpoint self.p) and then move self.p to your touchpos and then add the contents of newvecs to self.p and set each vertex to this new value and it should work. If you dont understand the above then feel free to send me a message me on here. Here's a newer version what do you guys think? I've added a few things and I think its overall better than before..
That looks fantastic @Luatee. I love the little pedalling animation you have going on the bike rider. It seems to correlate to the speed of the bike, nice touch. @Saurabh - re your query on moving the screen, i think you just need to translate your position. The Lua jump demo project (the little girl jumping on clouds) does this, and moves the screen as the girl jumps, in the draw function. I kinda want to know whole code just to play with it because it looks fun is it alright if you pm it to me. I posted the code for the basics from above, its pretty easy to go on from there, I'm going to try to make it in to a game first before I give out my code. @Luatee - thanks for sharing the spline code, I was just wondering how best to do that kind of thing. I think theres an alternative way of making the curve as there are a few ways of constructing bezier curves between points, this being my favorite, thanks! @Luatee - this is really cool! Think you've got a really nice set of game mechanics there - cant wait to see the final game! @andymac3d Thanks! I wanted to put in an unlimited amount of points at the start but I spoke to my friend who I thought might know being a math wizz and all but he said that if I wanted to put more points in I would have to constantly update the equation I use with more points and that seemed like too much but I suppose it wouldn't be too bad thinking about it now. You're class looks really good, but what I've been dealing with is FPS drop from drawing too much, how do you deal with this or have you not come to it yet? Hi @Luatee - I get around some of the performance issues by pre-computing as much as possible (via Tables) and only updating things when 'something' changes. This is quite important when using the 'Piece-wise' method of joining together Beziers that i've used, as obviously there can be a fair few iterations which can degrade the FPS, although I've got some pretty good performance so far with a reasonably large number of points. I guess the worse case is if all your control points are moving constantly, then naturally you'd have to continually recompute. Similarly, the number of parametric samples you use per span (ie. from 0 -> 1) to draw a smooth curve segment is also important. I'm using 30 samples which gives a reasonable approximation - although I guess increasing this will drop the FPS accordingly. 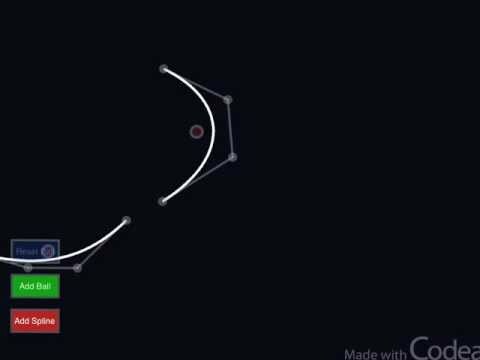 For most uses, where a sprite needs to follow a simple 'invisible' static path then most of this is not an issue - as you can pre-compute most of this and not even draw the curve at all - its then basically a simple 'lookup' of where it is on the curve to return x,y coords which is pretty fast! The Roller Coaster project included in Codea defines a parametrised track, but then it reparametrises it according to arc length to make it easier to make the motion more realistic. The Harmony drawing program draws its lines and curves using a mesh. It goes to some length to make the lines look nice and not just a sequence of disjointed lines. In particular, it uses a smoothing algorithm to add more points to the sequence (based on John Hobby's algorithm) and it handles the line joins. I also have a bezier shader. This is a mesh that uses a vertex shader to warp it to a cubic bezier shape. @Andrew_Stacey I didn't actually think the roller coaster had anything like this in it, but I haven't looked at many of the examples. I remember looking at harmony when I was making a drawing app and I could use a few things such as creating single images for each splines and drawing them, I can see this would improve the performance by 100 fold quite easily. To do this I would need to find the bounding box of a quadratic Bézier curve, in that case how do I do this? Also about the shader you mention is this for any shape of cubic? Aswell as that what is the performance like for this compared to normal meshes? Nice one @Andrew_Stacey - feel free to chip in! Would be nice to get some feedback as I progress with the Spline-Lib (having a Mathematician on-board is always a good thing! :-) . @Luatee I was about to say that the thing about the roller coaster is that the path isn't drawn, but then I remembered that it is drawn: as the roller coaster track. One of the time-savers there is that the track is static so once it's been computed and the mesh sent off to the GPU then there's no further computations to be done. When drawn as slabs, the track has 3672 vertices and the stars have 9600. The frame rate is around 60fps. I have a variant where I replace the track by a tube with upwards of 72,000 vertices and still a frame rate of about 60fps. The exact bounding box of a Bézier curve can be difficult to compute but it is always contained in the convex hull of the control points. So use those (add a little something for line width). The shader is for a cubic Bézier in that that's how it is specified. But any cubic segment can be parametrised as a cubic Bézier so that's no hindrance. I actually use it in the Harmony app to do colour curves for images and there I convert between an ordinary cubic and a Bézier cubic. The trick with Harmony was to use meshes while a line is being drawn, and then when the user stops drawing it then to render it to an image. Rendering as it is being drawn takes too long, but keeping it all in a single mesh proved complicated as well. By doing it when the user stops drawing then they don't notice if the frame rate dips momentarily. @andymac3d I decided to do the reparametrisation using a step-by-step approach. That is, I step along the curve at incredibly small intervals and test to see when I get more than the desired step along and mark that point. Solving the actual arc-length reparametrisation is only possible for "nice" curves and even then it can be a pain to compute so I figured this was a better way to be able to handle all curves. @Luatee Incidentally, what would be a reasonable test for my cubic shader? I could throw in a number of shaders with varying parameters and see what frame rates I get. What would be a reasonable number of cubics to draw? I just tried it with a single mesh (200 interpolation points, so mesh size of 1200 vertices) and redrawing it n number of times where I pass the control points to the GPU on each draw cycle (and I made them vary so that they had to be passed anew to the GPU). I had reasonable FPS for up to n = 150 (reasonable meaning above 50). By 200, the FPS had dropped to the mid 40s. Mind you, by 200 then the whole system is pretty much filling the screen! @Andrew_Stacey I'm not really in to 3d at the moment, so I haven't looked at the roller coaster much. Although I did do something similar using a lua coding environment in 3d before where I created the track infront of the train using keys and rotating the direction and such but I have tested the meshes a lot and I found that its more dynamic the mesh then the slower it seems to run but if its just sat there static then it doesn't take up much memory at all. Finding the Bézier bounding box shouldn't be hard if I give it the four points, I think what makes it hard is crossing over the points so they aren't in order (from the algorithm I used anyway) so any help off you for that would be great. I saw this and I continued to integrate that sort of system of drawing in to my old drawing app which worked out well, the reason why I need to get the bounding box of the spline is to create an image of that size to store it in unless there is a better way for me to do this. You're test seems to have better outcomes than mine, but the issue I face is which a frame rate drop when the draw function is running whilst not in simulation. If you have a way of me integrating that it would be useful, although I wouldn't use it in my actual game as I'd like to do the creating of it myself. Here's my shader with two auxiliary drawing functions for quadratic and cubic beziers. 200 step points (nstep in the code) seems plenty, at 100 then with a full-sized curve you can tell it is segmented, 150 looks fine. @Luatee The qbezier function in my code is a quadratic bezier, and it's the right conversion from a quadratic to a cubic so you'll get exactly the same curve as you would with the quadratic bezier. I just tried the code @Andrew_Stacey and it works like a f1 car compared to the drawing I had going on before, thanks! I'm working on making it into a library of bézier-related commands. I think that there's a slight speed saving by creating a new mesh for a new bézier. That is, if you have a dozen curves and they don't change their parameters then it's quicker to create a dozen separate meshes and keep drawing them than to have one mesh and change its parameters each time. Yes indeed - yet to touch shaders as yet and would be really interested in a shader oriented Bezier class/library as well - really interested in the general performance speedup! I'll continue with my non-shader version for my game, as its less to do with raw display performance - more a convenient/simple/fast method of specifying paths for sprites and other useful functions (e.g. closest point to curve etc..). Quick question: Would either of you (@Luatee and @andymac3d) have a use for a function that computed a sequences of béziers through a given set of points, so that the resulting curve looked smooth? That is, you specify a set of points and there's an algorithm that computes a set of Béziers, one between each successive pair of points, which match up well. I stopped working on it but here's the code, shouldn't be too hard to integrate its in classes for the most part.